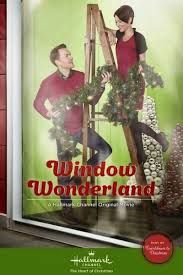 Window Wonderland (2013) Rated TV-G | What to Watch. Two co-workers vie for their dream job as window dressers. Starring Chyler Leigh, Paul Campbell, Naomi Judd, Cameron Mathison. I loved this film. Leigh and Campbell have such wonderful chemistry together. Of course, I have a soft spot for Campbell anyway, and look forward to seeing whatever he is in. For this role, he seemed really relaxed and natural. As a film, it is your standard Hallmark Christmas fare, but the message resonated with me. We all have secrets about ourselves that we don’t share with others until we find someone who makes us feel comfortable enough about ourselves to let our guard down and allow them in. This is a holiday film that’s worth a watch this season. This entry was posted in 2013, Canadian Films, Christmas Films, comedy, family, films, hallmark movies, Movie reviews, movies, Rated TV-G, reviews, Romance and tagged Cameron mathison, character, characters, chemistry, christmas films, christmas movies, Chyler Leigh, co-workers, dream, film, film reviews, films, hallmark christmas, holiday, job, lives, movie, movie reviews, movies, naomi judd, paul campbell, season, story, trailer, two, window dressers, Window Wonderland, worth. Bookmark the permalink.